Are you ready to WOW your crowd?? 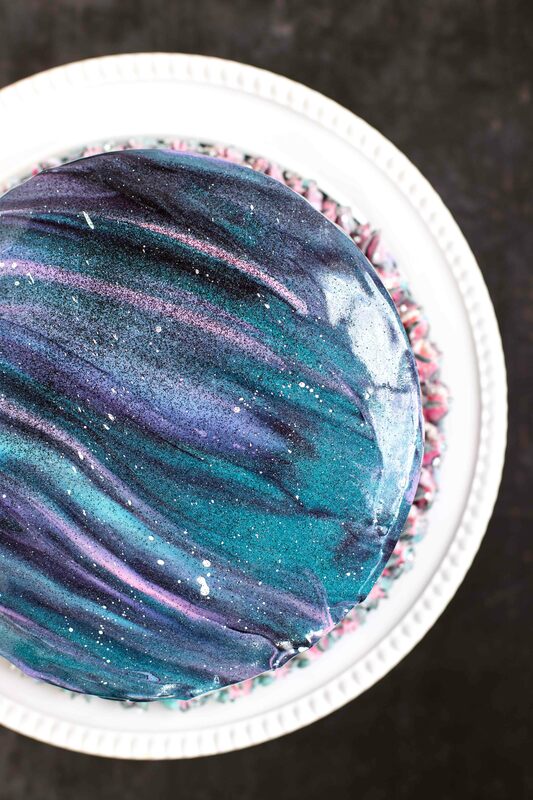 Because this Intergalactic Mirror Cake will undoubtedly do that. This year, for Henry’s 5th birthday, he requested an outer space cake. I asked him, “Outer space? Like a rocket?” He responded, “No mom, OUT-ER SPA-CE.” I just looked at him blankly… and then went to my computer and started searching on Pinterest. 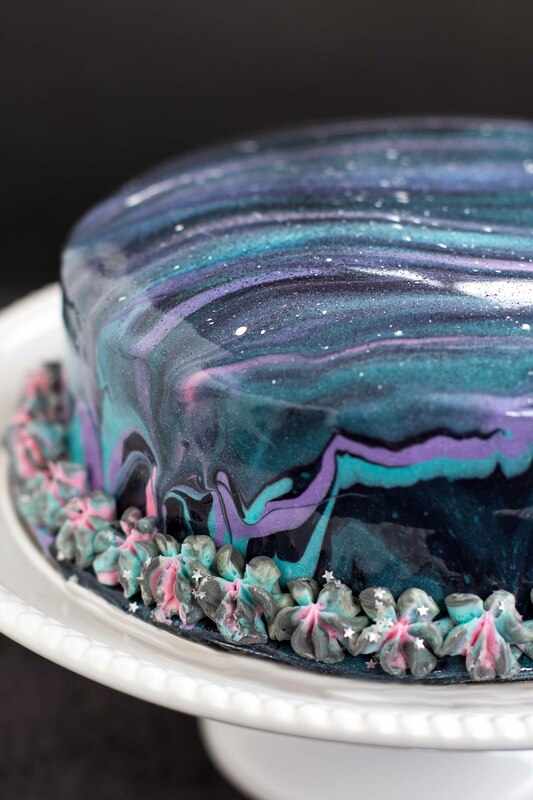 Sure enough, these beautiful Galaxy Mirror Cakes popped up. One was by Also the Crumbs Please and the other was made by Laughing Squid both of which have very good step-by-step videos. If you’re thinking about attempting this cake, you should definitely watch one of those videos first… at least a couple of times. 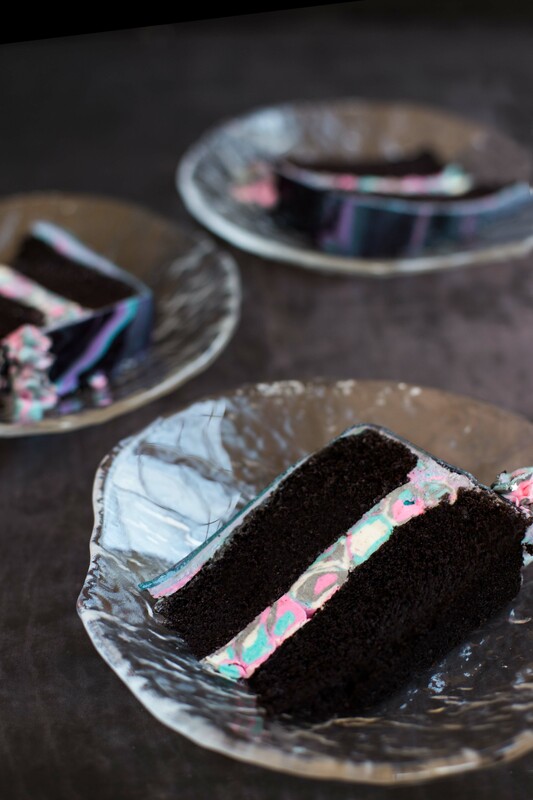 So, I was very curious about what the shiny outer layer of the Intergalactic Mirror Cake would taste like and it basically tastes like a marshmallow made out of rubber. It’s a taste that is not overly sweet and complements this chocolate cake perfectly. I decided to do a dark interior paired with the swirled colorful frosting and I think it looks pretty cool on the inside as well. If you’ve got a lot of stuff going on when you’re trying to make this cake (or just like to break things down) you can make the cake ahead of time and wrap in plastic wrap (once it’s totally cooled) and freeze it until you’re ready to use it. If it’s just the day ahead you can just wrap it in plastic wrap and leave it out. The frosting can also be made 1-2 days ahead and stored in airtight containers in the refrigerator. Just make sure you bring the frosting to room temperature well ahead of the time you plan on using it or you will not be able to spread it. 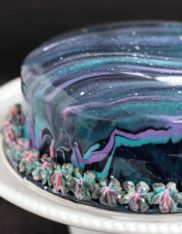 The mirror glaze, unfortunately, needs to be made right before you plan on using it but it’s actually not hard to make. And there you have it, the Intergalactic Mirror Cake that’s (by far) the most impressive looking cake I’ve made to date. It’s definitely a method I will be using again… Vivian is already requesting a “pinky sparkle princess cake” for her birthday. So, we’ll see what we can come up with from now until June. Until then, happy baking and experimenting with mirror glaze! Preheat the oven to 350°F and spray 2 - 9" round baking pans with nonstick spray and line with a round of parchment paper - set aside. In a medium bowl, sift together the flour, sugar, cocoa, baking powder, baking soda, and salt - set aside. In the bowl of an electric mixer fitted with the paddle attachment, combine the eggs, buttermilk, oil and vanilla. Mix until combined. Slowly add the dry ingredients to the wet ingredients with the mixer on low speed. With the mixer still on low, add in the freshly brewed hot coffee and mix until just combined. Scrape the bottom of the bowl with a spatula and divide the batter evenly between the two prepared pans. Bake at 350F for 35-40 minutes, until a cake tester comes out clean. Allow the cakes to cool for 10 minutes in the pans then remove them and allow them to cool completely. Place the butter in the bowl of an electric mixer fitted with the whisk attachment. Whip on medium-high speed until smooth, about 1 minute. Add the confectioners’ sugar to the bowl and mix on medium-low speed just until incorporated. Add in the salt and continue to beat on medium-high speed until smooth, about 1-2 minutes. Mix in the heavy cream and vanilla on low speed just until incorporated. Increase the mixer speed and whip on high speed until light and fluffy, scraping down the bowl as needed, about 4-5 minutes. Divide the frosting into 4 bowls. Add a few drops of Soft Pink to one bowl, a few drops of Sky Blue to the next, a couple of drops of Super Black (to get gray) to the third bowl and leave the 4th bowl white. Using 2/3 of the frosting, put alternating spoonfuls of each color into a large piping bag fitted with a large round tip - this will be what you fill the cake with and coat the outside of the cake with. Put the remaining 1/3 of frosting into another piping bag (alternate spoonfuls of each color again) fitted with a large star tip - this will be what you decorate the outside edge of the cake with. Add ¾ cup of water and gelatin in a small bowl and stir to combine. Allow to bloom for about 10 minutes - it should be firm to touch. Place chopped couverture (or couverture chips) in a big bowl and set aside. In a small saucepan bring sugar, 3/8 cup water, and corn syrup over medium heat to a boil and simmer for about 2-3 minutes. Remove from stove and stir in bloomed gelatin and condensed milk until combined. Pour the mixture over couverture, cover with a towel and let stand for about 2 minutes. Mix everything with a handheld emersion blender until smooth, and no lumps remain. Strain using a fine mesh sieve and separate mirror glaze into 5 bowls - two big ones, and 3 smaller ones. Add Teal and Navy Blue in a 3:1 ratio in one big bowl. Add Super Black and Navy Blue in equal amounts to the second big bowl. In the 3 small bowls, add Electric Purple, Soft Pink, and Teal. Add Bright White to brighten up the colors if needed. Very Important: When pouring the glaze it must be at 90°F for it to properly adhere to the cake. Too hot and it will melt the frosting and run off - too cold and it will be lumpy. Take one of the layers of cake and place it on a cardboard round. Add a layer of frosting using the piping bag with the large round tip. Place the second layer of cake on top. Cover the cake with frosting and use an offset spatula to get it as smooth as possible. Place the cake in the freezer while you prepare the Mirror Glaze. Prep a baking pan with a sheet of parchment paper and place a vase upside down in the middle (or something that will steadily hold the cake as you pour the glaze over it). Remove the cake from the freezer and place on vase on the prepped baking pan. Pour the Teal and Navy Blue Glaze into the bowl of Super Black and Navy Blue and swirl with a spoon. Pour that mixture all over the cake until it's evenly covered. Next take spoonfuls of the Electric Purple and drizzle back and forth over the cake. Then do the same with the Teal, and lastly the same with the Soft Pink. Take an offset spatula and drag it from one side to the other to blend the colors. Wipe it clean and drag it across the top again. Repeat all the way down the top of the cake. Next, put some of the black pearl dust in the palm of your hand and blow it onto the cake - this will add more shimmer to the cake. Lastly, pour some white food coloring into a bowl and use the paint brush to flick spots of white onto the cake to make the stars. Allow the cake to set. Use the frosting in the bag with the large star tip and make stars all around the base of the cake.